TWO Mile House and Milltown are shaping for a big weekend with the Kildare Intermediate and Junior champions hoping to book their places in Leinster finals by Saturday evening. Both teams have already shown their mettle to reach this stage. Niall Browne’s Two Mile House were comfortable winners over Monasterevan in the Kildare final but have had two tough games in Leinster since then. They finished their first game against Westmeath’s Shandonagh with 13 men following red cards to goalkeeper Didier Cordonnier and Shane Darcy but just about held on to a 2-7 to 1-9 win. The manner in which Two Mile House were able to dig in and hold on to a one point win despite playing into a strong wind for almost ten minutes of injury time showed their resilience. Their high scoring win over Dublin champions Round Towers Lusk was more typical of Two Mile House. It was a game with two teams committed to attack and a thrilling encounter eventually finished with a 4-14 to 1-16 win for the House. Throughout the season, Two Mile House have proved themselves to be a very well balanced outfit. Willie Burke, although he left the Round Towers game early due to an injury, Nathan Sherry and the experienced Matt Kelly play key roles in defence. In attack, Chris Healy has picked up where he left off after his best season for Kildare during the summer, Aidan Casey was named as the Intermediate Footballer of the year for his performances this season and Mark Sherry is constant threat too whether at full forward or coming from deeper. Players like Cordonnier, Caomhan Doolan, Jack Collins, Conor Keogh and Finian Breen have stepped up this year too to become important plaeyrs on the team as well. The jewel in Two Mile House’s crown though is undoubtedly their captain Peter Kelly. He was superb during the Kildare championship and it can only have been a toss of a coin between him and Casey for the Intermediate Player of the Year but in Leinster, Kelly has moved his game up a level again. When the House were under pressure late on against Shandonagh, it was Kelly who came up with a couple of big defensive moments to win possession and against Round Towers, he proved that he is equally as effective further up the field when he scored 2-2. Not quite at full fitness that day, Kelly spent most of the game at full forward but he could be named in any position and be Two Mile House’s best player. Even with their talented squad, Kelly remains their most important player and he rarely lets his club down. Two Mile House’s opponents, Courtwood, won their first Laois Intermediate in 31 years when they overcame Mountmellick Gaels last month. Managed by intercounty referee, Eddie Kinsella, there is a Kildare link with their management team with John Doran and former Laois goalkeeper Fergal Byron is also involved. Doran’s son, Luke, a former Moorefield clubman, is on the team as is Kinsella’s son Alan. The best known player is Niall Donoher. The 32 year old recently retired from the Laois senior panel after a distinguished intercounty career and he is a key man in their attack. There is a further Kildare link to the team. Professional boxer Eric Donovan has been working with the team for the season so Two Mile House can assured that Courtwood will be in peak physical condition. The Laois team have already won one away game in this competition when they beat Louth side St Mochtas so they will travel to Newbridge in high spirits. There has been an aura about Two Mile House this year and with home advantage going their way, the 2013/14 All-Ireland Junior champions seem well placed to book a place in a Leinster final. Milltown’s route to their provincial last four has been just as treacherous. They came through a tough test in their opening Leinster game when they travelled to Aughrim to beat Kilcoole. However, the way things worked out, their home quarter-final against Naomh Eoin of Carlow turned into an ever bigger battle. Like the Leinster game that Two Mile House played in Hawkfield against Shandonagh, Milltown finished that game with 13 players and after Naomh Eoin scored four points in a row to get back level with five minutes to go, it seemed only a matter of time before the Carlow side got in front. But Milltown proved a stubborn opponent. Those final five minutes proved that they aren’t just treating the Leinster Championship as an end of season bonus, as some teams do, they are determined to go all the way. Typically over the years, it’s been people like Colin O’Shea or Eoghan O’Toole who have shown the leadership for Milltown but on this day it was Kevin Byrne who stood forward to be counted. Byrne has always been a solid, dependable and hard working player but on this occasion, he went above and beyond the call of duty and dragged his team over the line. Milltown will need that and more again against a side who played senior football in Offaly as recently as 2015. 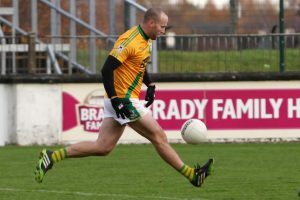 St Brigids were highly fancied in this year’s Offaly Intermediate but came a cropper Ferbane, who weren’t able to take their place in the Leinster by virtue of being the second team in the club. That means St Brigids are still on the hunt for a trophy and showed what a good team they are in their quarter-final win over St Finians of Dublin in the last round. The Offaly side were six points down at half time but turned the game on its completely in the second half. 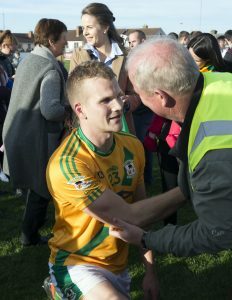 Offaly panellist Cian Donohoe is their star player. It should all make for a cracking encounter. 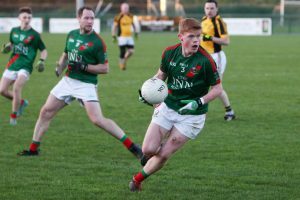 Milltown felt that the home crowd in Hawkfield was a big help in the closing stages of the win over Naomh Eoin and will be hoping for a big support again as they go in search of their first Leinster final in the 130th year of the club.